My Psychology is all about showing how psychology is relevant to students’ lives. 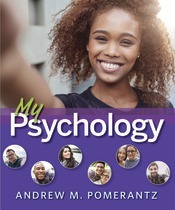 The My Take videos in every chapter feature interviews with real Intro Psych students relating their own “take” or personal connection with important concepts from the chapter. The videos are a reminder of the diverse experiences students bring to the study of psychology and emphasize the power of connecting experience to the course concepts. Each video is open to view as well as assignable and assessable in LaunchPad. In Chapter 10: Diversity in Psychology, real Intro Psych students share what culture means to them. In Chapter 6: Learning, real Intro Psych students discuss how they've experienced classical conditioning in their daily lives.